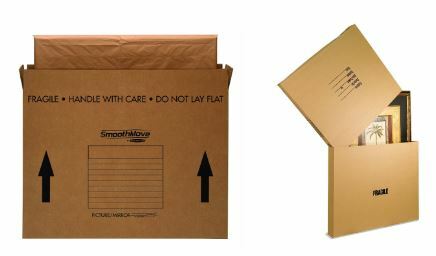 Boxes for shipping art canvas provide the ideal protection for your valuable pictures and paintings. These come in different shapes and sizes and have different features to improve the safety of your canvas while in delivery. We think that doing a proper packaging job for your frame will help you avoid most of the risks when shipping valuable artwork. As you probably know, there are a lot of risks when shipping things so we will help you avoid some of them. As we’ve mentioned, there are inherent risks when shipping different objects, artwork included. The best way to reduce them is to do what’s in your power. This especially refers to careful packaging. Frequently dropping items. Shippers are notorious for improper handling of packages and boxes. Accidents can happen so keep this in mind when you pack. Liquid spills on packages. Yes, this is also a risk when having things delivered. Just think of a courier that parks his van a couple of hundred feet from your home. If it’s raining, it will rain all over your box until he loads it into the van. Improper storage while transport. This is also a major hazard. Try to make the box as sturdy as possible, and you will reduce this risk significantly. Losing your package. This also happens from time to time. Make your package stand out. Use crazy colors if you want. The more noticeable your package is the less risk someone will miss place it. Last but not least, bad packaging. Do a good job and you should be safe! When shipping artwork, you have to take into account the risks we’ve mentioned in the other paragraph. Whether its framed artwork or not, the steps are more or less the same. There are some minor differences you will have to take into account. The first layer of protection should cover the picture itself. Try and find an acid free paper. If not, a standard paper should do it. Use it to cover the front of the drawing and don’t apply a big pressure. The second thing you must do is use bubble wrap. Use the bubble wrap to cover the entire painting. Don’t forget to avoid putting extra pressure on it. After it is covered, you will use standard duct tape to lock it in place. To make sure you do a very good job, use some stretch foil and cover the bubble wrap. This will hold everything in place securely. The last step is to insert them into the shipping box. Try and fill the empty place with paper or other soft materials so the painting does not move inside. Top Tip: Use silica gel bags and put them in the shipping box. They will do a great job at sucking in the humidity. Especially for watercolor paintings, you should avoid high humidity. Compared to unframed material things can be a bit different. More or less you will be using the same materials as you would for framed paintings. Start by covering the actual painting. Use an acid-free paper or standard paper to cover the drawing. After that use bubble wrap and put it on the paper. I would recommend using more layers of bubble wrap until it gets to the same level as the frame. You will now have to strap the bubble wrap in place, so it doesn’t fall during shipping. Long strips of paper can be used, which will go round the painting. Either that or just use stretch foil to keep everything in place. The last step would be to use another bubble wrap and go over the entire painting and stretch foil it in place. This way, the frame will also be protected. You can choose from different types of shipping boxes for artwork. This will be influenced by the dimensions of the paintings and the safety requirements you need. This box is perfect for small paintings or mirrors. They come in a pack of 25 pieces. It only allows for sizes up to the dimensions of the box. You won’t be able to extend it if you need to. If you pack the artwork carefully you should be fine and the box will last most trips. We do recommend you use either a stretch foil or duct tape to secure the box once it is closed. Maximum artwork dimensions up to 52 x 8 x 60 inches. This box is heavy duty and has double walls for a loading capacity of up to 100lbs. Besides paintings, you can fit huge mirrors and even furniture pieces such as table tops. The box comes in Kraft Brown color and it is sold as 1 piece. It is 24 x 36 x 5 inches, so it can fit most standard drawings out there. This box is excellent for shipping paintings, mirrors and other flat items. The major advantage is the fact that it will automatically adjust to the size of the item you want to ship. You should pack and unpack this box carefully. This will let you reuse the box many times, even for smaller or larger items. It can be bought as a single item or in a pack of 5, for major cost savings. As you can see, boxes for shipping artwork are very easy to use and they don’t cost that much. We suggest you use them when shipping both framed and unframed art material, mirrors or other flat furniture items.